The popular notion of genius is that it is some sort of flammable substance, like cardboard, that burns brightly and then burns out. We think of Coleridge writing the Ancient Mariner, six more poems that are worth reading, and then surviving, utterly uselessly, for decades. 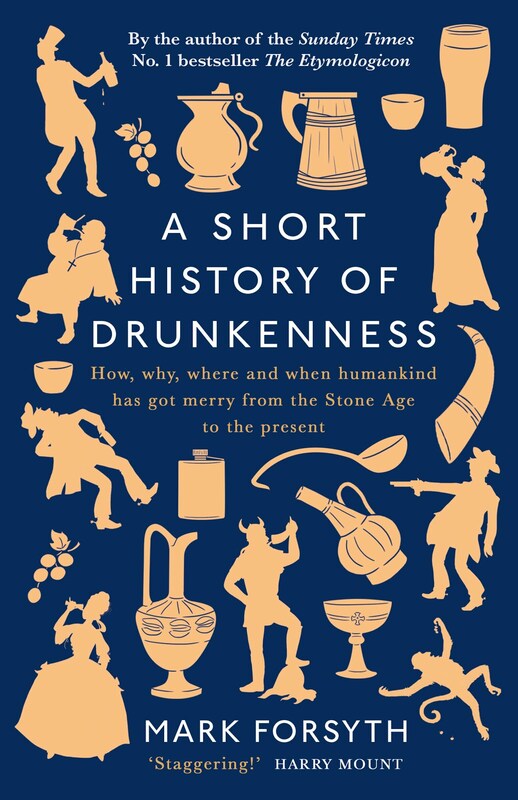 We think of Auden or either of the Amises and we do not consider it at all strange that their first books were their best and their most recent are a trifle embarrassing. We think of the solo careers of the Beatles and all those other burnt out rock stars. Often this idea of burning is confirmed when the flammable genius in question drops down dead: Keats, Shelley, Byron, Marlowe etc etc. Too great to grow old and other such claptrap. It is curious that we think like this, but that is the popular notion. Shakespeare does not obey it in the slightest. Shakespeare’s first plays are, to be frank, nothing special. Nobody is quite sure of the order the early plays were written in, but we have a fair idea. If we take as a rough metric of a play’s quality how many quotable lines it contains, we can go through and you'll see what I mean. How many lines can you quote from Titus Andronicus? None? Then you’re normal. Don't worry. Comedy of Errors? Love’s Labour’s Lost? Anything springing to mind? Henry VI part 1? Nope? Nope. Shakespeare’s first famous line is probably “First thing we do, let’s kill all the lawyers.” It's hardly one of the immortals but it's the only memorable thing in Henry VI part 2. Part 3 has a couple of good lines. Richard III has four or five and so it grows: steadily and by degrees. Each play is a little better than the last. Each play shows a slight improvement, a greater technique, the mistakes are ironed out. Of course there are dips, but over the course of a decade, by these slow degrees, Shakespeare went from Titus Andronicus to Midsummer Nights’s Dream, to Julius Caesar to Hamlet, which contains precisely a thousand and one memorable lines. And there are no great turning points on the way. There is no coming of age, no moment when he realised the Secret. If his ability was a gift from God then it seems to have been paid in instalments. He climbed Mount Helicon by inches. He can appear rather like the dim but diligent schoolboy who learns the syllabus by heart. He was the opposite of the Coleridge method; the opposite of the brightly blazing genius whose combustion we have become so familiar with. Of course, there's nothing strange about this idea when you think about it. Logically one would imagine that anybody in a non-physical job should get better and better as time goes on. That's how we would think of doctors or lawyers or poultry farmers, yet for some reason it's not how we think about artists and not how we think about genius. If, by genius, we mean a gift that a man is born with and which cannot be learnt, then Shakespeare didn’t seem to have it. I said elsewhere that Shakespeare was all technique. I would go so far as to suggest that he had no genius at all. He learned it. Which leads to the curious conclusion that the greatest artist the world has ever produced was talentless. Yes. This absolutely. The notion of spontaneous and fragile "talent" as opposed to craft and the capacity to learn through practice has done more damage to writing as an art form than any other idea in history. This blog post, or something very similar to it, should be taught in schools and inserted as a foreword into every edition of Shakespeare's complete works. Interesting when you consider that, in Britain, the only writer who is absolutely compulsory on the curriculum is Shakespeare. By coincidence, Joel, I'm going for a drink in parliament this evening. I'll have it on the National Curriculum by midnight. I rarely comment on this fascinating blog but I found this post troubling. Whilst I see the benefit of viewing a writer's work in the context of a career, this approach, in itself, is accompanied by potentially unhelpful critical assumptions. Consider the number of commentators (Bloom for one) who rigidly segregate the plays into categories such as 'Early/Apprentice', 'High/Mature', and 'Late'. An obsession with tracing 'development' through Shakespeare's career can blind us to moments of unrivaled quality and originality in the earlier plays and the workaday in the 'famous ones'. Your selection of plays is, naturally, skewed to support your argument. Coriolanus, in my eyes a fine, underperformed text, postdates Hamlet, but is of far lower profile. 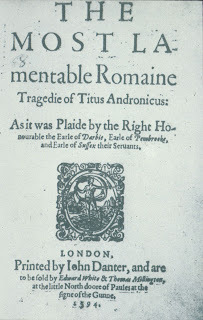 The fact that, say, Titus, according to your post, has no memorable lines is a product of the limited Shakespeare 'canon' as it is offered in schools and the mass media, and, the connected issue, of performance frequency, and not a reflection on the play's quality. Indeed, Titus surely offers two of the most arresting visual episodes of the playwright's work (and, of course, one should be wary, especially with Shakespeare, of divorcing script from performance) in Lavinia's mute identification of her rapists and some rather tasty pies. It is the task of criticism to problematize the notion the early work equals inferior work just as it must problematize the idea that all Shakespeare is 'genius'. Save fables, which thy children shall disdain. And charged all things with awe. Which, after all, is true. I can still recall the jolt I received in my second year at university, when I realised that so many of Shakespeare's plots weren't original. That they were adapted, taken, twisted, but that they were not novel. I felt as if I had stumbled into some great literary conspiracy, that there should be more fuss about this, and why had no-one told me before? Everyone else accepted it, though, and seemed quite calm, so I kept learning, and learnt that it was everywhere; perhaps there are only so many stories in the world. 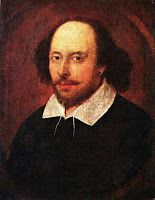 I also think it's interesting to classify Shakespeare as an artist; would he have done the same? This was his job, after all; he had to produce stories for people to perform so that the play could go on and they could all get paid. It was work - I know some writers talk about how they work at writing, but it is usually self-imposed. Shakespeare was perhaps more like a screenwriter for a sitcom, or Neighbours - ok, that's a little extreme, make that The West Wing (except Season 5). It's a job; yes, it's cool, it sounds good when you tell chicks about it, but you have to turn up and write stuff and sometimes it gets used whether it's good or not. (Like Season 5). Which is a roundabout way of agreeing with you. It was his job, he got better at it. Not that everybody does that, but enough people do that we're not surprised. And just putting my proofreading hat on (I'm going back to work next week: who will be pedantic then?) I think you might be missing something: "Of course, there's strange about this idea..."
Responding to the comments by Anonymous (come on out, Anonymous - declare yourself! ), the rapists and tasty pies are another reason why Titus isn't taught in schools .... although the kids might wish they were, the parents probably don't! First, I'm very fond of Titus myself. Back before the days of caller ID I would often answer the phone with the words "Who doth molest my contemplation". "This is not generous, not gentle, not humble" (from LLL) is beautiful. But for all my affection I can see that the early works are vastly inferior to the great ones. Second, the plays are, of course divided every which way. 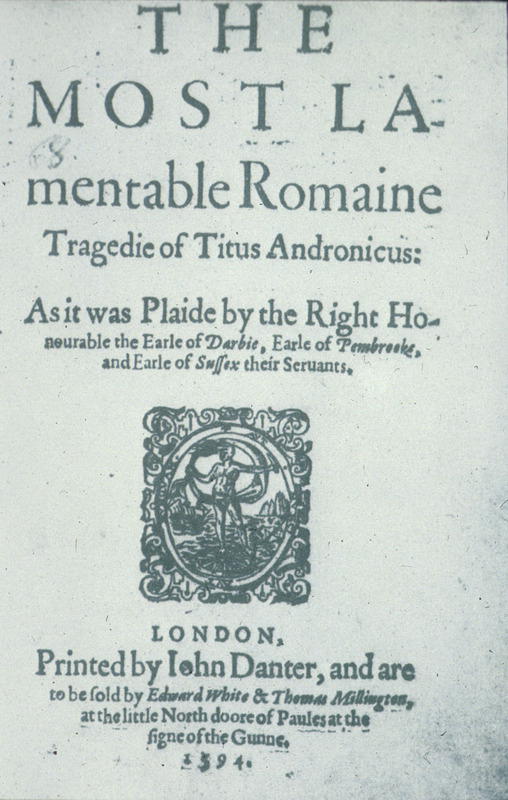 Roman/Problem/Tragedy/Comedy/Early/Mature etc. I'm not sure what conclusion you're drawing. Divisions are useful fictions. I can't quite make out whether your argument is that all the plays are equally good. If that's the case I must leave you in the dungeon of error. If you're arguing that Henry VI isn't known because it isn't performed or taught in schools, then I would agree whilst adding that it isn't taught in schools because it isn't very good. If, on the other hand, you are suggesting some sort of media conspiracy to suppress Comedy of Errors then you Know Too Much and must be silenced. On the subject of Coriolanus. You're quite right, but I was limiting myself to a discussion of the first ten years (I also carefully avoided the Problem Plays, because they're problematic). My chronology was honest. Some people can quote one line from TGOV, but that's probably because it was mentioned in Shakespeare In Love. I shall, at some point do a follow-up post about the move from A&C to the Tempest, but I have a tendency to witter on for far too long. Pies. I could do with a pie. Have you ever noticed there's an episode of South Park that uses the plot of Titus? It's rather funny, and ends in exactly the same way. The idea of genius burning made me think of nostalgically of Pater's "burning with a hard gemlike flame". That's about the only line I remember from my term on the Victorians - for some reason there was a fad for Pater among my classmates, and we'd try to quote him at any opportunity (in essays, in libraries, in the pub...).